On October 23rd the Brooklyn Museum opened their exhibition exhibition James Tissot: The Life of Christ (October 23, 2009-January 2010), organized by Judith F. Dolkart and made possible in part with support from the National Endowment for the Arts. 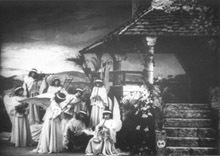 The work of James Tissot is a tie-in with the Whitney Retrospective of Alice Guy Blachés work because it was a Bible illustrated with watercolors by Tissot that set Guy Blaché on the road to making her masterpiece from her Gaumont Period, La Passion ou la Vie de Notre Seigneur Jésus Christ (The Passion or the Life of Our Lord Jesus Christ). This film was a blockbuster for 1906: 660 meters, (runs over half an hour) with 300 extras and 25 hauntingly beautiful sets, all designed by Henri Menessier. 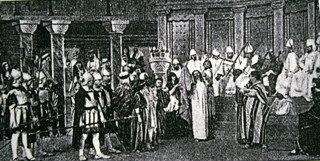 The sets and costumes were all based on Tissot’s watercolors published in the so-called Tissot Bible, a turn-of-the-century bestseller in England, France, and the US. The Brooklyn Museum exhibition includes 124 selected from the complete set of 350, as well as a copy of the Tissot Bible itself. Jacques Joseph Tissot was a successful salon painter and "dandified boulevardier" in Paris in the 1860s who relocated to London during the 1870s. It was there that he anglicized his name to James Tissot. When he returned to France in 1882, he found his style of painting was out of favor. However he was swept up in the Catholic Revival of the fin de siècle -- a combination of biblically based fundamentalism and spiritualism -- and converted to Catholicism after seeing a vision in the church of Saint Sulpice. He then used his sketches and photographs as the basis for his "intuition" -- he would go into a trance and then start painting scenes from the life of Christ. For images of biblical Jews, he used the faces of Yemenites he had sketched in Palestine, but for the Romans he drew on the faces of Parisian waiters. His Bible was published in French in 1896 and was an instant success. The paintings themselves were exhibited twice in Paris, once in London, and toured the United States and Canada (the entire collection was purchased by the Brooklyn Museum through public subscription). Streams of people viewed these images with hushed reverence, often dropping onto their knees to pray in front of one and then proceed to the next image still on their knees. Veronica&#039;s VeilSide-by-side with his claims that the images were a result of "intuition" or divinely inspired, Tissot highlighted the fact that topographically they were very exact. 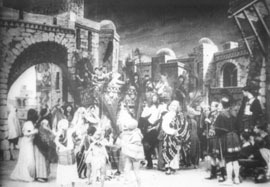 It is apparently this fidelity to topographical realism that inspired Alice Guy Blaché to use Tissot's Bible as the visual inspiration for her La Passion; in her memoirs she notes that she also hired two Jesuits "recently returned from a pilgrimage to the Holy Land" as consultants on the film. It seems clear that the Kalem film took Guy's idea a step further: instead of painting sets that were based on Tissot's images, an attempt was made to duplicate Tissot's images on location. For a review comparing Zecca’s film and the Kalem film, with screenshots, look here. Buy them here. 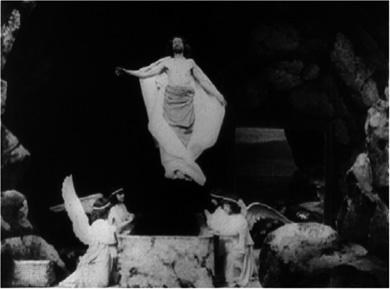 Guy Blaché's version of La Passion stands out visually for Menessier's often breathtaking sets. In contrast with Zecca's La Passion made at Pathé the year before, Guy designed her film to emphasize the use of deep focus and to have movement filling the frame along diagonal lines. Although Jasset was in charge of directing the exteriors, it is clear that Guy had a comprehensive plan for the entire film, as the lines of movement and use of deep focus stand out whether the tableau is set on a stage with painted flats or whether it is on a location. For the sets, Tissot's paintings have been copied quite literally in some cases, such as in the setting for the Last Supper or the scene known as “Ecce Homo”; other times only visual motifs have been borrowed. For example the brick archway in the Nativity scene is actually taken from Tissot’s painting The Flight to Egypt. The depiction of her character's internal struggle has become quite sophisticated and is the focus of each new tableaux. Her Passion differs in many significant ways from the established genre of passion plays, notably in the "insistence on privileging women in relation to Jesus" as Richard Abel points out. As he and others have noted, three of the miracles represented involve women, and some are miracles not usually depicted in other passion plays. Even when she stages an obligatory scene like the Nativity or the Crucifixion, she focuses on the Virgin Mary and other female characters as much as possible. Although this film, with its return to self-sufficient tableaux that could be sold individually, represented a return to an earlier form of cinematic narrative, certain moments stand out for their complex characterization. One of the most striking of these scenes is the tableau for the Last Supper. Judas approaches Jesus as if he wished to speak, and suddenly Jesus is transformed into a vision of what he will look like after his death and resurrection, with his wounds, the crown of thorns, and a host of angels. The vision frightens Judas and sends him scurrying off to carry out his betrayal, although he seems to accept his ordained destiny against his will. Once he leaves Jesus becomes himself again and continues serving food to his other disciples, who seem to have noticed nothing. The scene is a masterful expression of Judas' dilemma: to not betray Jesus and therefore prevent salvation for the rest of humanity, or to betray him, let him save the world, but be damned himself. 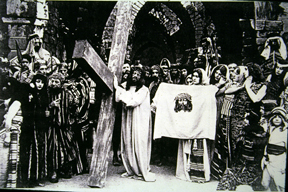 On Saturday, December 5, 2009, 5:30-6:30 pm., there is a special Screening of Alice Guy’s La Vie du Christ (1906) at the Brooklyn Museum. This screening, a partnership between the Whitney and the Brooklyn Museum, affords visitors a chance to compare the mediums of painting (and its translation into printed images) and film as related narrative forms. Following the screening will be a discussion comparing and contrasting the points of view of filmmaker and painter, led by Judith F. Dolkart, Associate Curator, European Art, Brooklyn Museum, and curator of the Tissot exhibition; Catherine Morris, Curator, Elizabeth A. Sackler Center for Feminist Art, Brooklyn Museum; Joan Simon, Whitney Museum curator-at-large, organizer of the Alice Guy Blaché exhibition. For more information, visit brooklynmuseum.org. Presented as Part of Target First Saturdays at the Brooklyn Museum. Tissot, James, The Life of our Saviour Jesus Christ, i, p. ix. Reynolds, “From Palette to the Screen,”p. 277. Abel, Richard The Ciné Goes to Town: French Cinema 1896-1914, Berkeley: University of California Press, 1994, p. 166.